PARTNER NEWS: STMicroelectronics has launched the ST54J, a single system-on-chip that lets mobile phone makers cut bill-of-materials costs, reduce PCB space and deliver faster performance by combining an NFC controller, secure element and eSIM into one unit that supports mobile payments, e-ticketing, remote provisioning and more. “Spearheading the fourth generation of ST’s proven embedded secure element family, the single-chip ST54J ensures faster contactless interaction than a discrete chipset by eliminating performance-limiting off-chip data exchanges between the secure element and NFC controller,” ST explains. 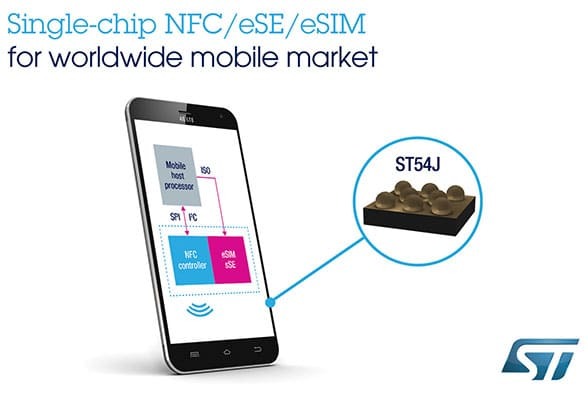 Geneva, Switzerland / 27 Sep 2018 — STMicroelectronics (NYSE:STM), a global semiconductor leader serving customers across the spectrum of electronics applications, revealed its highly integrated mobile-security solution, the ST54J , a system-on-chip (SoC) containing an NFC (Near-Field Communication) controller, Secure Element, and eSIM. The SoC delivers performance-boosting integration for mobile and IoT devices, with the added benefit of ST’s software-partner ecosystem for smoother user experiences in mobile payments and e-ticketing transactions, as well as more convenient, remote, mobile provisioning to support multiple operator subscriptions. Spearheading the fourth generation of ST’s proven embedded Secure Element family, the single-chip ST54J ensures faster contactless interaction than a discrete chipset by eliminating performance-limiting off-chip data exchanges between the Secure Element and NFC controller. In addition, a faster, state-of-the-art core for each function further accelerates contactless transactions with mobile terminals and enhances roaming by supporting secure-element cryptographic protocols used worldwide, including FeliCa® and MIFARE®. Packaging and design flexibility comes from the space savings of integrating three key functions onto a single chip. In addition, ST used its NFC booster technology to enhance the performance of the NFC controller, allowing it to establish robust contactless connections with a small-size antenna, allowing designers even more generous freedom to manage space inside the device and minimize the thickness of new smartphone generations. ST delivers the ST54J to customers with NFC firmware and the GlobalPlatform V2.3 secure element Operating System, which provides best-in class cryptographic performance and optimum eSIM interoperability. The OS also allows flexible configurations to support eSE-only or combined functionality. In addition, as the first chip maker accredited by the GSMA to personalize eSIMs for mobiles and connected IoT devices onto WLCSP packages, ST can shrink the supply chain and accelerate delivery to manufacturers. Samples of the ST54J are available to qualified customers only. Contact your ST sales office for pricing options and sample requests. Please visit www.st.com/st54j for further information.